This book was written to help graduates find success as they begin their careers. For some, graduation is quickly approaching and the stress of landing a job is starting to increase. These new workers may be educated but are they prepared for the expectations of a job? To help upcoming and recent graduates as well as new professionals ease into the working world, Russell Bunio shares 50 best work practices that he has picked up from successful leaders and adapted to his own work ethic, resulting in success. 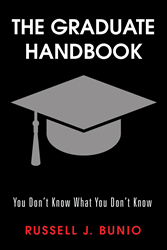 “The Graduate Handbook” guides readers through what to expect in a workplace, including how to approach interviews, meetings and building work relationships. Focusing on what to do to be successful, Bunio provides a solid foundation by helping individuals define success and jump-start their careers. Broken up into six sections, Bunio starts with the basics and leaves readers with an understanding on how to implement these best practices. To pay-it-forward, he is donating 100 percent of the proceeds to nonprofits helping people enhance and advance their lives. Russell J. Bunio’s career began with an entry-level position at General Motors before later becoming vice president of The Boeing Co. and vice president of supply management and procurement at Cummins Engine Co. Bunio studied economics at West Virginia University and attended the European American Study Center in Basel, Switzerland. He has served on numerous boards of directors and received the National Minority Supplier Development Council Appreciation Award for his personal commitment and dedication to helping minority suppliers with entry and participation with Corporate America.